When selecting the best elastomer for a Sealing application, an engineer or designer must be prepared to answer a series of questions about the physical, mechanical and chemical resistance properties required for the seal. Unless the material specifications have been pre-designated, gathering this information about the material's end use and the functional requirement of the seal in the application will help to ensure the material sustains its physical properties through temperature, environmental factors and time. The best place to start gathering information is by taking a close look at what the application will require from the compound. For replacement products, examine the properties and service conditions of the original material. This information can provide the foundation for what properties are desired, and what are not, in the new material. For new products, the properties of materials used in similar applications can provide valuable information. The following checklist provides several characteristics that need to be taken into consideration when specifying a material. Listed brief summaries of the properties of seven of the most versatile polymers, as well as physical and chemical resistance comparison charts. These lists are by no means all-inclusive. However, the majority of sealing solution needs can be met by using these popular materials. For a complete list of polymers, including specialty and high-tech materials, please contact a KAS sales representative. Silicone (Polysiloxane) features excellent resistance to ozone, sunlight and oxidation, and is very color stable. It maintains excellent flexibility at low temperatures, has outstanding resistance to high heat, low compression set and is a very good electrical insulator. However, it is not recommended for applications that require abrasion, tear and cut growth resistance, or high tensile strength. It is also not recommended for resistance to oil, gasoline, solvents, alkalis and acids. EPDM (Ethylene-Propylene-Diene-Monomer) is found in a wide range of applications and is excellent for outdoor use. It is well known for its excellent ozone, weathering and aging resistance. It also has excellent water and steam resistance, maintains its flexibility at low temperatures, features excellent resistance to alkalis, acids and oxygenated solvents, and is very color stable. However, it is not recommended for resistance to oil, gasoline and hydrocarbon solvents. Neoprene (Polychloroprene) is generally considered an excellent all-purpose elastomer with a solid balance of properties and few limitations. The polymer has moderate resistance to oils and gasoline. It features good flame resistance, weathers well and has very good resistance to brasion, flex cracking,alkalis and acids. However, neoprene provides poor resistance to aromatic and oxygenated solvents and has limited flexibility at low temperatures. Nitrile (Acrylonitrile-Butadiene) has very goodoil, gasoline and abrasion resistance. Resistance to alkalis and acids increases as the nitrile content of the compound increases. Nitrile must be specially compounded for resistance to ozone, sunlight and natural aging. It has poor resistance to oxygenated solvents. Nitrile is superior to neoprene in oil and solvent resistance, but is not recommended for applications where it is exposed to severe weathering. Fluoroelastomers (Viton) provide premium performance and long-term reliability in very harsh and corrosive environments. Their exceptional resistance to heat, aging and a broad range of fuels, solvents and chemicals makes them ideal for many demanding aerospace, automotive and industrial applications. Fluoroelastomers also offer excellent resistance to weather, ozone, oxygen and sunlight and are inherently more flame retardant than hydrocarbon rubbers. Fluoroelastomers have poor resistance to ketones, esters, ethers, amines and aqueous bases (i.e., ammonia and sodium hydroxide). SBR (Styrene-Butadiene-Rubber) has excellent impact strength, good resilience, tensile strength, abrasion resistance and maintains its flexibility at lower temperatures. However, it is not the polymer of choice where resistance to oil, gasoline and hydrocarbon solvents is required. SBR materials are also not suitable for exposure to the outside elements, such as UV and ozone. Typical uses of SBR have been in tire treads, conveyor belt covers, mats and even shoe soles. TPE (Thermoplastic Elastomers) are materials that have comparable properties and performance to their rubber counterparts but are processed like other thermoplastic materials. TPE is a collective name for several differentfamilies of elastomers that may contain differences in composition and molecular structure. Their performance properties are similar to conventional thermosets, such as natural rubber, SBR, EPDM or neoprene. The important features of TPEs are their flame and ozone resistance, excellent flex fatigue, and performance in alcohol. TPEs, however, are limited by their poor resistance to aliphatic and aromatic hydrocarbon solvents as well as oil and gasoline. Ethylene-Propylene Diene Monomer (EPDM) is a synthetic rubber. EPDM is a primary ingredient in the compound that is used to create these Gaskets, Profiles or Membranes. 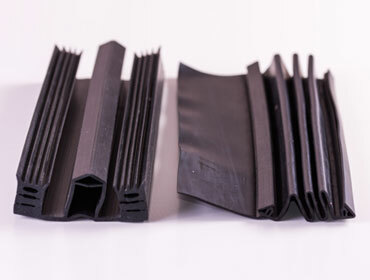 Other ingredients include carbon black, oil and vulcanization systems; however the unique properties of the finished product are generated by the EPDM. 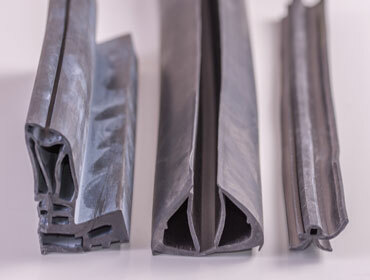 The rubber compound is produced in large mixers, shaped into a profile or a molded article through an Extruder, then vulcanized by heating the shaped compound at 240-260 degrees Celsius in a Microwave Oven, resulting in the finished rubber product. EPDM Rubber demonstrates excellent environment and thermal stability, with superior heat aging properties and resistance to abrasion and flex fatigue, whilst retaining flexibility at extremely low temperatures. It is resistant to a wide range of aqueous and oil based fluids, UV and ozone attack without degradation and is non-migratory. The EPDM Rubbers do not require reinforcing fillers or extenders to achieve their high level of mechanical properties. All the above properties make EPDM a superior choice than other conventional Elastomers like Neoprene etc. Why EPDM and the Construction Industry are a good fit ? EPDM rubber articles provide superior UV & Ozone resistance; long life and elasticity. As a result, EPDM is a highly valued material in the Building Construction Industry (primarily – Aluminium Fabrication Segment, Curtain-wall Industry, uPVC Doors & Windows Segment and Expansion Joint Segment), which represents 40% - 45% of world wide EPDM usage. Within this category, Curtainwalling systems is the largest application (40%). 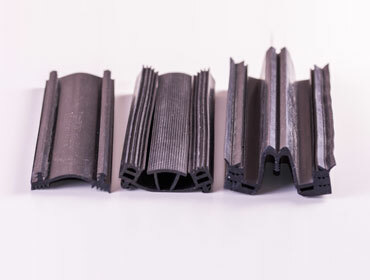 The Roads & Bridges segment of the Building Construction Industry use EPDM Expansions Joints primarily because of it's intrinsic nature of being Ozone Resistant. Once a rubber compound has been vulcanized the material is irreversible. The material shape can not be changed by heating because it won't melt, but it will burn. For this reason the rubbers are referred to as thermoset materials. To give a finished rubber product elasticity as well as strength, carbon black is added to the compound. As a result, rubbers can only be produced in black. Thermal ageing, with superior heat ageing properties and ability to withstand varying climatic changes, thus maintaining excellent deflection recovery performance. Excellent resistance to UV and Ozone attack, thus resulting in no migration and staining. Various colors. Solid. No serious effects anticipated under normal conditions of use. No known applicable information. Inhalation : No serious effects anticipated under normal conditions of use. Eyes : Not applicable under normal conditions of use. Ingestion : Not applicable under normal conditions of use. Skin : Not applicable under normal conditions of use. Pre-existing eye, skin and respiratory disorders may be aggravated by exposure. Fillers are encapsulated and not expected to be released from product under normal conditions of use. Flammable / Combustible under high heat and flame. Can generate toxic and combustible fumes, - carbon monoxide, chlorinated and hydrocarbon compounds, and soot. Use full protective equipment and SCBA, filter masks, etc. High expansion Foam, Water fog and Spray. Product is non-reactive with aliphatic hydrocarbons and non-polar chemicals. Do not use in contact with strong acids and alkaline solutions. Stable under normal situation. Flammable and Combustible. Store below 35 °C in cool, dry location. Combustion products are toxic, combustible and corrosive. May cause skin irritation. For prolonged handling, use protective gloves and clothing. Wash hands with mild soap after handling. Avoid contact with eyes. If the eyes are irritated, flush with water for ten minutes. Obtain medical attention. Excessive inhalation can cause headache, nausea, irritation. Handle the product in minimum quantity and work in well-ventilated area. Disposal must be in accordance with Federal, State and Local Regulations. Bury waste in approved landfill site. Package the Product in Paper, Plastic Film or Carton Box in order to minimize surface exposure. Store Under normal Warehouse Conditions in cool, dry and ventilated area. The surface loss of a material due to frictional forces. The resistance of a material to loss of surface particles due to frictional forces. Increase the speed of vulcanization, and in many instances, also improve the final product's physical properties. These activators work with accelerators to reduce vulcanization time and improve a compound's final characteristics. Materials such as antioxidants and anti-ozonants that serve to slow down the deterioration of rubber products that can occur as a result of exposure to light, heat, oxygen, radiation, ozone, etc. A cavity or sac that deforms the surface of the material. Any substance that alone, or in combination with other substances, is capable of producing a cellular structure in a plastic or rubber. Blowing agents include compressed gases that expand when pressure is released, soluble solids that leave pores when leached out, liquids that develop cells when they change to gases, and chemical agents that decompose or react under the influence of heat to form a gas. Chemical blowing agents range from simple salts such as ammonium or sodium bicarbonate to complex nitrogen releasing agents. A generic term for materials containing many cells (either open, closed or both) dispersed throughout the mass. Also known as Sponge Rubbers - it is a cellular material made of rubber. Cellular rubber products all contain cells or small hollow receptacles. The cells may either be open or interconnecting, or closed and not interconnecting. The process of extruding two or more materials through a single die with two or more cavities arranged so that the extrudates merge and weld together into one structure. Inadvertent densification of a cellular material during its manufacture resulting from breakdown of cellular structure. An intimate mixture of a polymer with all the ingredients necessary for the finished article. The PSI required to compress a lab slab a specified percentage of overall height, normally 25 percent. A method of molding in which the rubber compound is molded between two plates that fit together to form the mold cavity. A molding press is used to provide the necessary force to close the mold. The residual deformation after removal of the force that has subjected the specimen to compression. An instrument for measuring the hardness of vulcanized rubber or plastic. Shore 00 scale is for sponge, Shore A dense/solid. An arbitrary numbering scale that indicates the resistance to indentor point of the durometer. High values indicate harder materials. Surplus material that is forced into crevices between mating mold surfaces during a molding operation and remains attached to the molded article at the parting line of a mold or die, or is extruded from a closed mold. A molding process in that the mold halves begin the process clamped together. Once the mold is clamped, preheated rubber is forced into the sprue of a hot mold. The surface cracks, checks or crazing caused by exposure to an atmosphere containing ozone. A partially completed part that will be subjected to subsequent forming operations. Adhesive, which in dry form, is aggressively and permanently tacky at room temperature and firmly adheres to substrates upon contact without activation by water, solvent or heat. A measure of the resilience, usually as the percentage of vertical return of an object that has fallen and bounced. Also known as caoutchouc. It is a material that is capable of recovering from large deformations quickly and forcibly, and can be, or already is, modified to a state in which it is essentially insoluble (but can swell) in boiling solvent, such as benzene, methyl ethyl ketone and thanol-tulene aseotrope. Strain remaining after complete release of the load producing the deformation. Cellular rubber consisting predominantly of open cells made from a solid rubber compound. In an injection or transfer mold, the main feed channel that connects the mold-filling orifice with the runners leading to each cavity gate. A material upon the surface of which an adhesive is applied for any purpose such as bonding or coating. The resistance to growth of a nick or cut when tension is applied to the test specimen, commonly expressed as pounds per inch or newtons per meter. A molding process where a rubber preform is heated and forced by a plunger through a funnel-shaped opening, or sprue, into the mold cavity. Often considered a form of compression molding. Preferably used to denote the product of vulcanization, without reference to its shape or form. An irreversible process during which a rubber compound, through a change in its chemical structure (i.e., cross-linking), becomes less plastic and more resistant to swelling by organic liquids, and elastic properties are conferred, improved or extended over a greater range of temperature. The addition of vulcanizing agents to a compound's composition affecting its physical properties. They must be stable, free from bloom and possess the required building tack; all of which is dependent on the compounding and processing. The surface deterioration of a rubber article during outdoor exposure, such as checking, cracking, crazing or chalking.